The Heritage Foundation think tank has issued a thoughtful paper that adds much-needed perspective for the cowering Republicans and giddy Democrats rush to enact a massive immigration package. "Encouraging Lawful Immigration and Discouraging Unlawful Immigration" comes from Heritage's legal shop, so it gives due consideration to the effects of "comprehensive immigration reform" on what was formed to be a sovereign, self-governing, republican nation, a nation of laws and not of men. Yet, every proponent of mass amnesty for the 11-plus million illegal population is willing to sell out our country's foundation in exchange for prospective new ethnic identity voters. 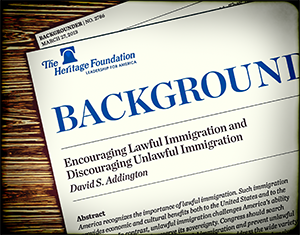 The key takeaways from this Heritage gem by David S. Addington are that amnesty harms the rule of law and that immigration law should be addressed step by step, not in one fell swoop. The complexities involved in encouraging lawful immigration and deterring unlawful immigration call for a measured set of approaches tailored to a wide variety of immigration issues, rather than comprehensive, all-or-nothing, and one-size-fits-all legislation. Grants of amnesty, regardless of the form of the reward they give to aliens who knowingly entered or remain the U.S., discourage respect for the law, treat law-breaking aliens better than law-following aliens, and encourage future unlawful immigration into the United States. America recognizes the importance of lawful immigration. Such immigration provides economic and cultural benefits both to the United States and to the immigrants. In contrast, unlawful immigration challenges America's ability to protect its borders and preserve its sovereignty. Congress should search for appropriate ways to encourage lawful immigration and prevent unlawful immigration, through careful step-by-step actions to address the wide variety of immigration issues, rather than through one-size-fits-all comprehensive legislation. Congress should not adopt failed policies of the past, such as an amnesty, which discourages respect for the law, treats law-breakers better than law-followers, and encourages future unlawful immigration. When Congress implements step-by-step the proper policies, American will benefit greatly from the resulting lawful immigration. Pandering politicians rushing to an ill-fashioned, ill-advised immigration bill should step back and carefully consider the deleterious consequences of the "comprehensive" legislation they're barreling toward. After all, they swore to uphold the Constitution. And the Constitution is nothing if not the embodiment of American sovereignty — against all enemies foreign and domestic.